Have you read The Harbinger by Jonathan Cahn? I haven't, but I have listened to a series of talks he gave on the subject and was surprised by the content. Jonathan Cahn has an interesting perspective on Isaiah 9. The information he shares has amazing & frightening parallels to what has been happening in the U.S. particularly since 9/11. A friend brought this article which was posted on wnd.com to my attention. In it the author shares what Jonathan believes is one more step in a progression toward impending judgment (which could also be called consequences to disobeying God's laws). I pray we repent and return to Him quickly, but I am no longer convinced that will happen without a serious wake-up call. The author of “The Harbinger,” the inspiration behind the “Isaiah 9:10 Judgment” documentary, says the seventh harbinger is no more. 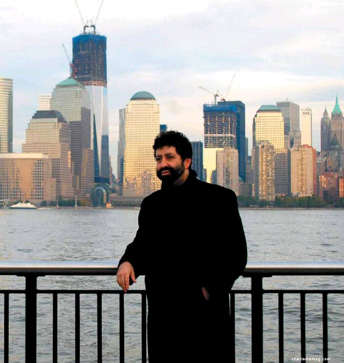 “Harbinger” author Jonathan Cahn says it’s because of his book that the tree will not be replaced.A tree that was placed at the site of the 9/11 Muslim terror attack in New York City has died, has been removed, and destroyed. His work examines the nine harbingers, or warnings, recorded in the Bible that were delivered to Israel before the nation disintegrated. He contends God is giving the same nine warnings now to America to urge the nation to repent. 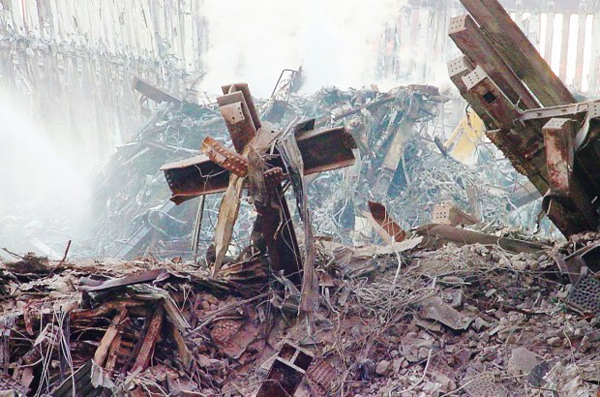 One of the harbingers was a sycamore tree at Ground Zero, which after the destruction of the Twin Towers was replaced by an evergreen, a move Cahn believes follows the Isaiah prophecy. Now the replacement tree is gone, he said. “The ancient sign of nearing national judgment has been manifested. The erez tree has fallen. The seventh harbinger now speaks of impending judgment. The Tree of Hope, the symbol of America’s resurgence … is dead,” he explained. “The keepers of the Tree of Hope did everything they could to save the withering tree. They even changed the soil in which it grew. But no matter what they did, the tree continued to wither away and die,” said Cahn. Only recently did Cahn discover that “The Harbinger’s” prophecy has come true. 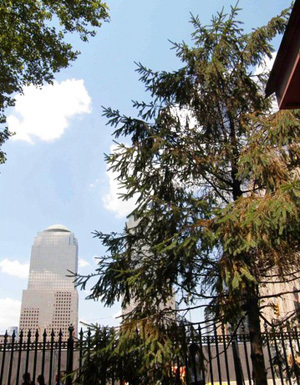 The news came to him from those who had recently walked the grounds of St. Paul’s Chapel in New York City at the corner of Ground Zero where the erez tree had been planted in place of the fallen sycamore. Unlike the planting of the Tree of Hope, which was done publicly and followed by a publicized ceremony, the tree was uprooted with little notice given, out of the public eye. In fact it was only after several inquiries were made as to the trees disappearance, that WND found out what happened. The Tree of Hope, the symbol of a resurgent America, was uprooted in the spring of this year. The day after its uprooting, it was entirely destroyed. He said his source regarding the destruction of the tree also told him there would not be another tree planted because of “The Harbinger.” He said that because of the book, people have been coming from all over the United States to see the tree. 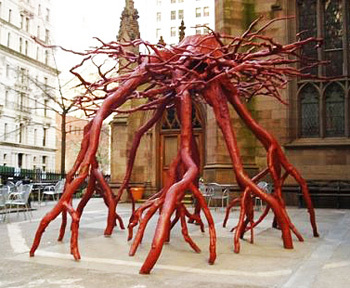 WND reported earlier on the Old Testament prophecy, the tree that was struck down and the replacement tree in New York. The roots of the sycamore tree were preserved as a memorial. “The Harbinger,” which is described as a wake-up call for Americans, deciphers the stunning connections between the cryptic biblical prophecy and current events. The words were first uttered by leaders in ancient Israel in response to a limited strike by Assyria on the lands of Zebulun and Naphtali. The prophet makes clear it was a limited judgment by God against apostasy. The purpose was not to destroy the nation, but to awaken it, according to most commentaries. The northern kingdom of Israel did not repent of its rebellion against God’s commandments and was eventually conquered and removed from its land by the ancient Assyrians. Eventually, the southern kingdom of Judah also was overcome by the Babylonians after the Jews refused to repent as well. Cahn, the pastor of the Jerusalem Center-Beth Israel Congregation in Wayne, New Jersey, claims the prophecy’s statement the “bricks are fallen down” refers to the crumbling of the World Trade Center. The verse, he says, connotes an attitude of defiance, a desire to rebuild with stronger materials instead of acknowledging the hand of God and moving toward national repentance. The verse mentions sycamore and cedar trees, and it’s here that things start to get eerie. Not only was a sycamore tree struck on 9/11, but it was replaced in the exact same location by another tree of the type mentioned in the original Hebrew, an “erez” tree, which is the same genus as the cedar. And that’s what took place in 2003, as a conifer tree, the “Tree of Hope” as it was called, was planted in the spot where the sycamore was slammed on 9/11. But Cahn now is warning that America is advancing down the path that Israel followed to destruction. The loss of the tree “is another ominous sign concerning America,” said Cahn, because it appears to be following a known path. Cahn says America is uncannily re-enacting ancient Israel’s behavior prior to its judgment and eventual fall.